This tableau is brimming over with the life of creation gathering a great many of its representatives: animals of the deep and inhabitants of the air, creatures of past and present those who sleep and those who make music. Whether noble or ordinary, man or beast, all are part of the same assembly gathered around the Lord of Creation. Uniform in color and execution, these little clay figures are singing their humble praise of the Incarnation. 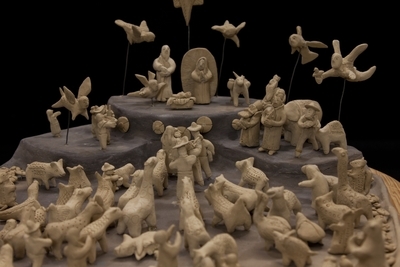 Handsculpted clay figures depicting the nativity of Jesus, made by Geraldo Isasa in Guatemala. The exact date of creation is unknown. Exhibition label originally written by Fr. Johann G. Roten, S.M. for exhibit entitled "At The Manger" and held at Roesch Library, University of Dayton.